ARRRG!… I’ve said it before and I will stand by it. Some people do not deserve to have children. It should be mandatory that when a girl get her period they go on birth control and when they are ready to have a kid someone has to come and check out the living conditions and a mental exam has to be administered to both parents and they have to pass and then they grant you permission to have a child. I personally think it would save a lot of children. Being a woman myself and seeing this type of stuff I am all for it. IGNORANCE IS PREVENTABLE!!! Why on earth would anyone living in the United States harbor the belief that the government should have total control over everyone’s life, including their most basic right, to reproduce? While I do understand that child abuse is a very serious problem in this country, the solution is the exact opposite of what she proposes. If everyone took responsibility for their own lives, there would be no child abuse or neglect. Obviously, total personal responsibility is merely a philosophical ideal, since there will always be those who refuse to step up and take responsibility. Nevertheless, the failure of the few to take responsibility for their lives does not negate the right of the many to do so, without government interference. The same people who harbor such beliefs would likely scream to high heaven if the mother in question – who abused her infant after losing her temper when the baby cried for days on end – had undergone an abortion rather than giving birth to a child she likely did not want, and definitely could not handle. Regardless of what the uninformed among us believe, giving a child up for adoption carries a stigma as well. Many times a pregnant woman finds herself in the position that she’s damned if she does have the child, and she’s damned if she doesn’t have the child, due to social pressures. I don’t have the answer to this dilemma, but I do know that government control over reproduction is not the answer. After all, many otherwise completely normal mothers lose their tempers with crying infants, socioeconomic status notwithstanding, so governmental control would not stop the problem. That does not excuse the behavior, but it does prove that the suggestion made above is rather ignorant; though strangely, she attributes ignorance to those who dare disagree with her. If denying the government the ability to grant or deny such a basic human right as reproduction is her definition of ignorance, I will gladly bear the title. Don’t get me wrong, I am not excusing the mother for abusing her child; far from it, in fact, since I find the abuse of the helpless to be the most heinous crime of all. However, there is an undercurrent in this country, with its basis in extremist religious beliefs and the far right, which uses child abuse cases as an excuse to advocate that the government take total control over the reproductive lives of its citizens. These extremists do not understand that government must be controlled, and never given carte blanche to do whatever it wants. 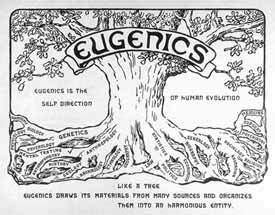 Yet they would grant the government the right to decide who can reproduce, and when they can reproduce; and as history has proven, in no time the government would turn that power into a eugenics program wherein the poor – which by necessity would include many minorities – would not be permitted to reproduce at all. That’s absolutely insane. I fear for the future of this country, when I read such comments. Perhaps it is easier for some if they don’t have to take any responsibility whatsoever for their lives; but when they are openly and actively advocating total government control over others’ lives, they have gone too far. As libertarians we have a responsibility to speak out, loudly and clearly, against anyone who would openly advocate such bizarre government programs. We have a responsibility to educate others about the very real dangers of giving the government too much control over our lives, whether we run across the statist mindset online, or in our personal lives. As libertarians, we must spread the word of liberty, even if only to one person at a time. We’re all familiar with John McCain, Hillary Clinton, and Barack Obama. However, have you ever wondered what other presidential candidates are out there? Are you longing for a presidential candidate who is really and truly different? If so, one of these guys just might be your man. Unlike most mainstream presidential candidates, God The Great Holy Spirit Saint Michael Jesus The Archangel doesn’t think he is God. He knows he is. This also ends the debate about the true name of God, since he quite clearly denotes his name as “Mike”. That’s a much easier name to spell and remember than “Yahweh”, for sure. Apparently God/Mike runs a “modeling agency”, and if his website claims are to be believed, it’s quite successful as models literally flock to him. I’m not sure how lucrative that endeavor has become for him, but that’s okay because he also makes his own money. By that, I don’t mean that he works and makes money. No, I mean that he quite literally makes money, which he calls “Heavenly Banknotes”. Are you against the Federal Reserve? He’ll take care of that problem too, and replace it with his own “Cosmic Reserve Bank”. Apparently God/Mike is an Old Testament kind of Creator, because he wants to arrest abortion doctors, judges who ruled abortions legal, and women who have had abortions, and execute them all within a year. He also thinks that smokers are both suicidal and homicidal, and he plans to arrest and execute, without representation or trial, all of the “tobacco lords”. He also has a problem with gay marriage, because the Bible (which he refers to as “My Holy Word”) speaks against it; for that reason, he plans to execute all gays and lesbians. On the other hand Mike/God is not quite so completely violent as it would appear, since he also thinks that nations should settle conflicts with a paintball war. On the other end of the spectrum Jonathan “The Impaler” Sharkey may not be a Papal Knight, a Knight of Malta, or a Knight of the Orden Bonaria like Daniel Imperato; or God, Jesus, or the Holy Ghost like Mike, but he is an ordained Satanic Priest. Not only is he a Satanic Priest, but a quiz on his MySpace profile declared that he is Satan, so it must be true. He also promises to murder (by impalement, of course) certain people with his own hands as soon as he takes office; that list includes Osama bin Laden, George Bush, O.J. Simpson, and even Mike Tyson. Jonathan is also a “Satanic Vampyre” as well as a “Hecate Witch”, and has some very serious military experience as a “Commanding General” of a vampire regiment known as the “Death Dealers”. He also has a great deal of previous political experience, having run for Congress in multiple states, for President during the last election as well as the present one, and he once also ran for Governor (of Minnesota). His campaigns have been unsuccessful, undoubtedly due to the media’s bias against third party candidates. On the downside, he must be one of those shapeshifters David Icke warns us about because, while in Florida, he assumed the name “Kathleen Sharkey” and claimed that he is is his own half-sister, and also his own pagan wife. He sent a notice to the FEC under the Kathleen persona, implying that Jonathan is dead. Not surprisingly, The Impaler does have an arrest record, including a record for stalking a former girlfriend, but for those who wish to support The Impaler, that could be easily spun into his being far more loyal than most people will ever be. He was also ordered to undergo psychiatric care since he believes himself to be a vampire, and of course that could be spun as his having had his right to practice his religion denied by the government. Despite The impaler’s shortcomings, there is always a way for a politician to spin anything into something positive. Then again, if God and Satan aren’t quite down-to-earth enough for you, there is also John Taylor Bowles. Bowles claims to be “the White People’s Candidate”. Dressed like a Neo-Nazi storm trooper, Bowles claims that it is “time for the white people to put a real white man in the White House”; apparently he believes that previous presidents weren’t really white. Bowles wants to give us lower taxes, lower food prices, free health care, zero unemployment, no outsourcing of jobs, forgiveness of all credit card debt so all white people start with a fresh slate, a 5% flat tax on income with all other taxes abolished, no more foreclosures, and interest-free mortgages (though together those last two items are equivalent to free housing on a first-come first-serve basis) ….. but only after he has deported all non-whites in a “humanitarian” manner. He plans to give all non-whites a one-time stipend of $30,000 to make their involuntary move more palatable. Bowles also wants to bring the white soldiers home, at which time he will position them at the southern border to help “stop the invasion”. He also believes that birth control is an invention of those who wish to destroy the white race, and to that end he suggests that whites take over the country by having as many children as possible (though if he deports all non-whites, we would have no need to out-breed anyone to maintain control). White families who produce four or more children will have their mortgage debt forgiven, though again, it doesn’t matter if the debt is forgiven, if there are no more foreclosures. I’ve heard this particular line of thinking before. Former wacky Libertarian candidate Gene Chapman suggested that libertarians out-breed the non-libertarians, and even offered to store his sperm for any women interested in bearing his children. He also mentioned that both he and his webmaster Doug Kenline were single. Big surprise there. Now that we’ve reviewed the candidates, here is the interesting question. Given that the mainstream parties limit our choices to only three candidates at this point, soon to be only two candidates; and given that many Americans do not agree with any of the mainstream candidates on the issues …. if these were the only candidates from which you could choose, who would you choose, and why? NEW: LAST FREE VOICE LIVE!